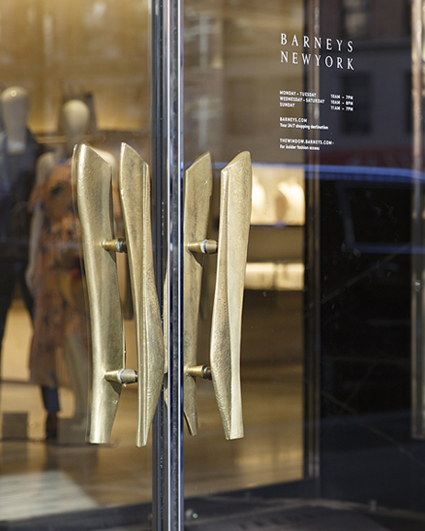 Sculpture artist Mig Perkins was commissioned by Steven Harris Architects to design the door pulls for Barney’s location in Chelsea. Hamilton Sinkler was chosen for our artisanal craftsmanship and casting abilities. With our cutting-edge manufacturing technology, such as laser-scanning and 3-D modeling, Hamilton Sinkler had the right custom capabilities to bring the artist’s vision to life. Our iterative, consultative process allowed for the hand carved model to transform into Barney’s stunning brass entrances.